The following is based on a commentary from 2012 on this blog. A few years ago I participated in a discussion about Stephen King. I could not believe the number of people who were bashing the guy. He has now written over 50 books–EVERY ONE OF THEM A BESTSELLER. Best guestimates are he brings in at least 40 million a year. And when he can write a book like 11/22/63 that can move me to melancholy for the better part of a day AND a week later still has me thinking about it, then I say the whole lot are out to lunch, jealous little people of no concern. This man is a great story teller. He HAS to be, to accomplish what he has done. Sounds like another great book–what an intriguing story line! You’re right, Stephen King is an extraordinary storyteller! The idea of preventing Kennedy’s asassination was what originally caught my attention, but when the story turns out to be a treatise on time travel–WOW! I think it’s safe to say there are a few time travel stories better than this one (King mentions a favourite of mine “Time after Time,” a story centred on the idea of Jack the Ripper as a time traveller. ), but only a few. I think this may be a book even those who aren’t King fans will enjoy. I agree with you, Clayton. 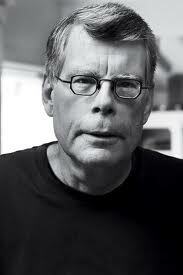 Stephen King knows how to tell a story, and those who bash his work must be envious of his talent. Great post and review. Thank you Sandra. It has been noted by smarter people than I that the higher up the ladder you go, the more people there seem to be who want to pull you back down. I’m sure King knows this, but it has been quite apparent in his interviews that these comments bother him a great deal. I think the worst one was the repeated habit so called “literary” pundits had of calling him a hack. That one went on until just a few years ago. Lot’s of people hate Wayne Greztky too, probably some of them hate Stephen King as well. But they just can’t understand, success speaks for itself. You’ve got that right, cousin. It’s amazing how many people are jealous of or even harbour malice for those who are more successful than they are. We would all be better off if we could just be happy for what we have and for what we may be able to achieve–leaving other people completely out of the picture. I guess another way to put what I’m trying to say is if Stephen King makes 40 million per year, as reported, I should be happy for the man. There’s no percentage in hating the guy.